Diono’s must-have organization and travel accessories! The Stow ‘n Go keeps everything organized for $10.99 and is easy to find when you need it. 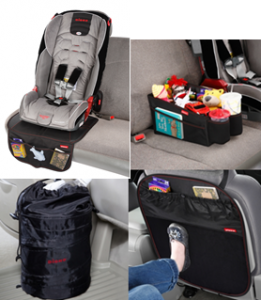 It is an under the seat organizer and has three full sized pockets in a washable, waterproof fabric. Features individual panels of high-density foam that contour to any vehicle seat and protect upholstery from the permanent indentations caused by child safety seats. Non-slip surfaces on the top and bottom prevent slipping and sliding of child safety seats. The travel pal was designed to keep those small toys that float around your car organized. It has a deep cargo bin for toys and lots of pockets for smaller things, too. Plus it includes insulated drink holders and the entire cargo area is waterproof – just in case. 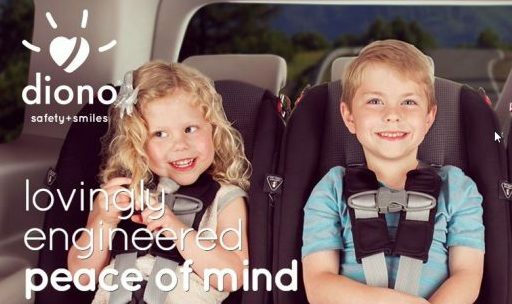 Travel Pal fits between two child car seats and it’s big enough to hold everything for both children! Arguably one of the best organizers for $15.99. This collapsible storage bin pops open when needed for those extra toys or for trash. The drawstring top keeps items secure ad it is made with water resistant fabric as spills are a daily occurrence in parents cars. The retail value is only $7.99 and it collapses flat for storage and travel. 7” W x 8” H. Takes Bag It disposable trash bags (not included). The Stuff ‘n Scuff also features washable, waterproof fabric to keep the messes to a minimum in the back of your car. The pop open design maintains its shape providing full seat protection and the cargo pocket holds everything. Fastens easily around any headrest and the adjustable lower tab secures it in place. It folds so you can easily store it in the car on the go! Make your car feel brand new with the Stuff ‘n Scuff for $10.99.